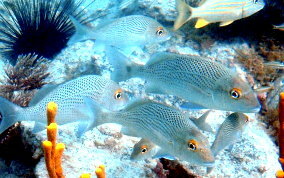 Although the Sailors Choice is a member of the grunt family, I see them more often, hanging around with groups of snappers. 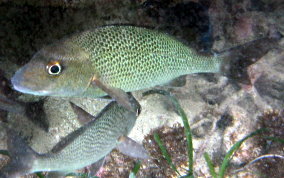 They can be distinguished from the Gray Snapper because their scales have dark centers which gives them a sort of spotted look. Always grey/black, not like the reddish phase of the Grey Snapper. The Sailors Choice's tail is forked, and the snappers is not. They can reach a foot in length. They will school in groups around caves and recesses. They don't seem to mind brackish water and are skittish and hard to approach.